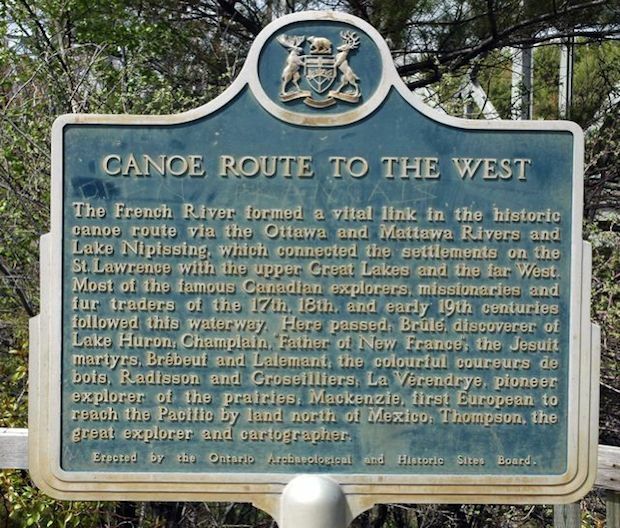 The French River formed a vital link in the historic canoe route via the Ottawa and Mattawa Rivers and Lake Nipissing, which connected the settlements on the St. Lawrence with the upper Great Lakes and the far West. Most of the famous Canadian explorers, missionaries and fur traders of the 17th, 18th and early 19th centuries followed this waterway. Here passed: Brûlé, discoverer of Lake Huron; Champlain, "Father of New France"; the Jesuit martyrs, Brébeuf and Lalemant; the colourful coureurs de bois. Radisson and Groseilliers; La Vérendrye, pioneer explorer of the prairies; Mackenzie, first European to reach the Pacific by land north of Mexico; Thompson, the great explorer and cartographer. Museum is up in French River Provincial Park and the plaque is in the parking lot. Check out the amazing snowmobile bridge (claims to be the biggest in the world).